The only way I will ever cook a roast (beef, pork, lamb, chicken, turkey, even meat loaf) is with a good probe thermometer (mine is the Chef Alarm from Thermoworks) in the center of the thickest part (not close to a bone). Anything else is just guessing, and that's no way to treat a good piece of meat. My Jenn-Air gas oven came with a probe thermometer that you plug into the side of the oven; then you set the probe temp to the desired finished temp and the oven temp to what you want. I set the finished temp to 128F and set the oven temp to 170 after it was done. It held beautifully till the sides were done. I gave DH a Weber charcoal smoker for Christmas, so we may try smoking one later this year. I have at least 4 different methods in my Living Cookbook now for doing a rib roast, and every one is is tried and proven. No one method is better than any other, they all work well when done as instructed, but ALL of them strongly recommend using a good thermometer. Most say that the time per pound method is nothing more than a ball park estimate, and the larger the roast, the less likely it is to work. For a really large roast, it is guaranteed to fail. Yes, definitely. The time idea only applies to a cut that is about as long as it is thick, and even then you are guessing. The cooking process will penetrate to the center by the shortest route. A 14 pound boneless rib roast like I had was quite a bit longer than it was thick, and cooking it for 15 minutes per pound would have put it at 3.5 hours, yet it hit 130° in the center in under 2 hours - another hour and a half and I'd have had a nice door stop. No matter the method, I too recommend checking the temperature to be certain. Just because I recommend a method does not mean i don't want you to measure the temperature of your food. For the record. I would trust Craigs method without the need for a probe as I like my roast rare. I would pull it out at the time indicated and allow it to rest. I'm probably sounding like a broken record by now, but my best prime, standing rib roast was done on a Webber Kettle, with a divided bed of charcoal and a drip pan between the charcoal beds and directly under the roast to catch juices for the au jus. And yes, I used a meat thermometer, and yes, I salted the outer surface of the meat before cooking. It was as tender, and juicy as another standing rib roast that was cooked by the heat, then turn off the oven and let sit method given to us by the butcher, but with the slight smokey goodness of meat cooked by charcoal. It wasn't smoked, as in adding smoking wood to the fire, but rather picked up that bit of smoke that enhances the natural beef flavor without replacing it. 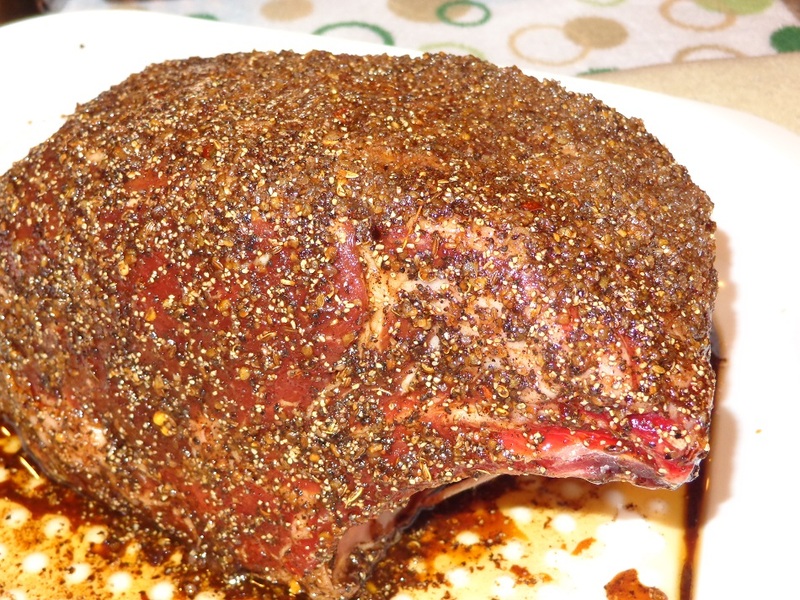 Next time I get a standing rib roast, I'm going to try the technique where the roast is encased in salt an roasted. I've heard very good things about that method. We did that back a few months ago with an eye of round (I think) that had an oil/herb marinade overnight, then dried, then salt crusted and roasted. It was pretty good but I missed the crust from the direct heat. To me, not really worth it in terms of cost of salt plus time to get it packed on and the mess when it was broken after cooking. Even though I tried to be as careful as possible and broke the crust in the pan, salt still managed to fly out and make a mess. 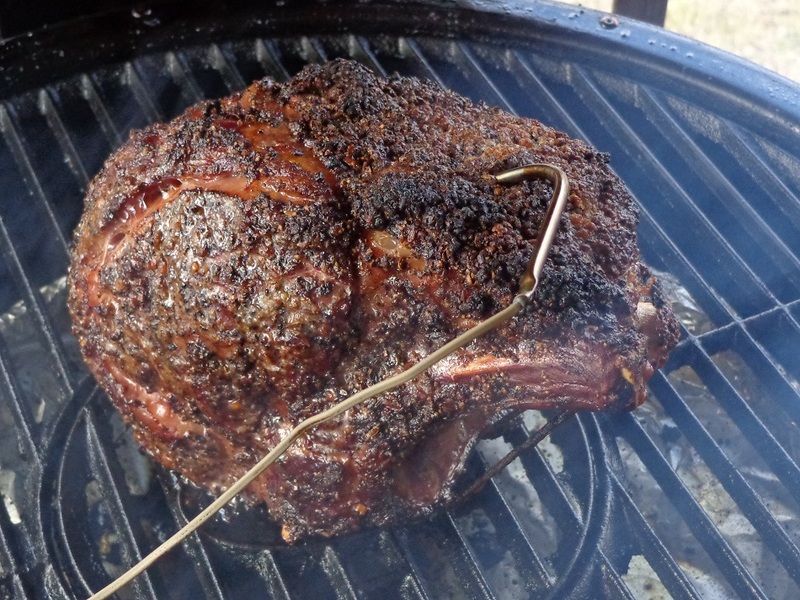 I do mine( standing rib roast ) on the Akorn. After doing several, it is now my and my families preferred method. That said, I have never put out the coin for Prime, just choice. That last picture is what my Sunday dinner SHOULD look like each week. Actually, prime rib doesn't have to be prime grade. 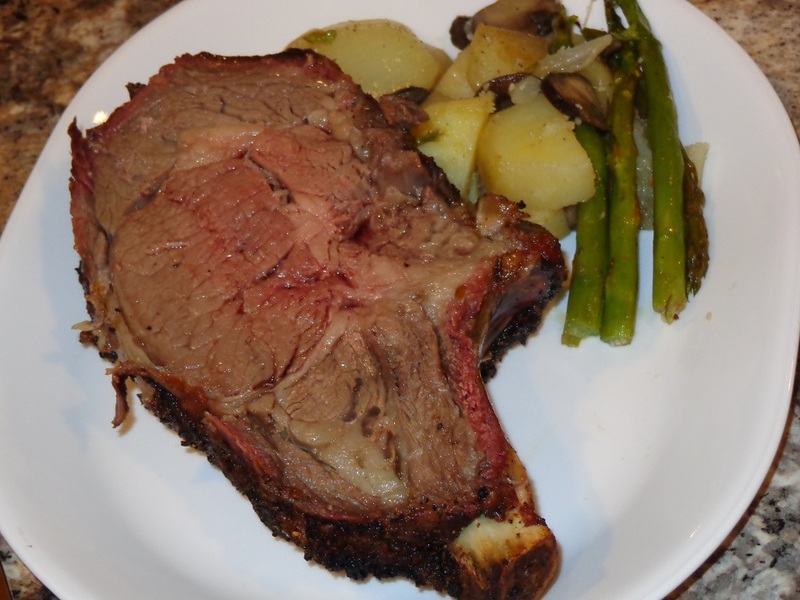 If it is cut from the primal ribs (fifth to tenth rib) of the beef, then it can be called a prime rib roast, and it's such a good cut that most people can't tell if it is prime or choice. At least that is what I've read, and seen charts depicting. I've read the same thing. 'Prime rib' is now an accepted terminology for a standing rib roast. Re: the linked chart - I'd guess that chart is meant for trained butchers as I find it difficult to follow. Do you route the probe cable out the bottom vent? Looks good. Very good. A little more rare for me though. No, I run the cable out the lid opening. The gasket seals around it fine. The roast was cooked the way the most squeamish of the diners, my daughter, likes it cooked. I would have preferred more rare as well.